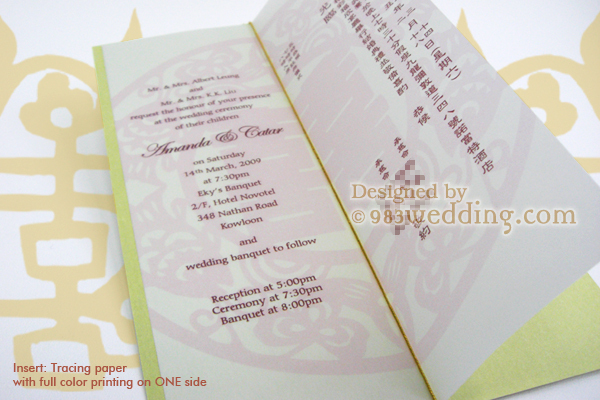 We introduce a more flexible insert design for your wedding invitation. 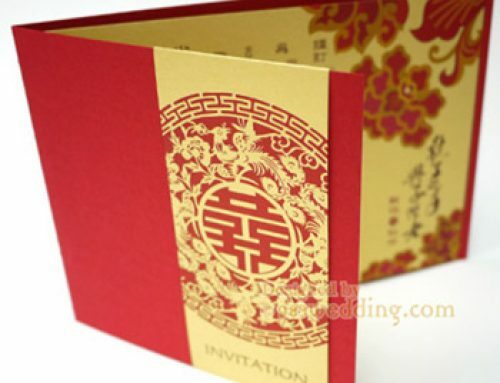 Instead of having wedding invitation content in plain text format, we can also add some Chinese traditional design element to it. 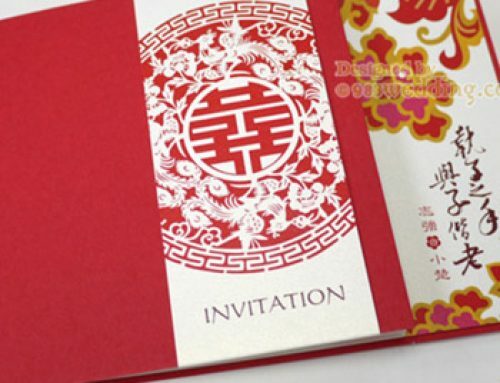 One of the advantages of this new design is that it can virtually fit into different invitation cover designs. As mentioned, only the wording, in a plain format, will be printed on the insert of the wedding cards. Some brides and grooms may find this treatment boring. 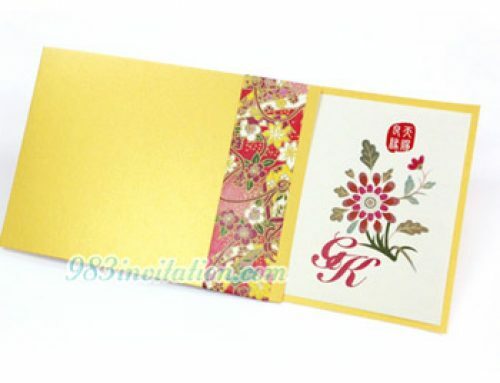 It is very true that you may want to make the wedding invitation inserts more elegant and attractive. It will be a good idea to have some graphic elements printed along with the wording. As a result, we have tried to do some new treatment to the inserts. Without any surprise, it is still important to add the wording and content to the insert. You cannot invite your guests without the wording. So, the main focus will still be the wording. We will not make the wording difficult to read or even invisible just becuase we want to add some new graphic elements to the insert. Let us say that you will need to have a bilingual invitation. You will need to use all the two panels of the insert of a folded card. In this case, we will add a background to the insert. 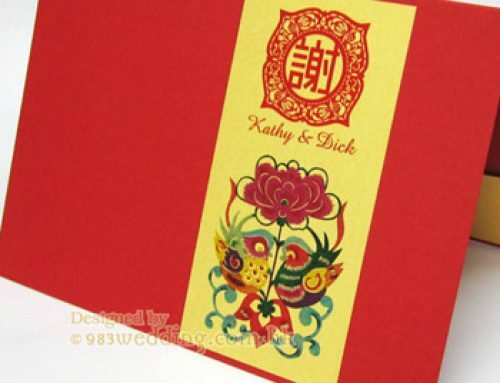 A double happiness symbol can be printed as a background. The size of the symbol will not be a small one. It will be a big one to fill the whole insert. Besides, this symbol is in the form of a paper cutting pattern. It is not a simple double happiness character. The color of the pattern will not be very dark. It will not be some extremely sharp color either. Instead, the color of it is extremely light so that it will be just like a watermark on the insert paper. The color of the double happiness pattern is in very light pink color. The color of the wording will be of course quite dark. We usually choose a dark brown color. To this end, we can make the graphic pattern subtle and the wording will certainly be readable. There can also be other options for the color of it. For example, it is possible to adapt foil printing and print a shiny silver or gold color on the insert. Please contact us for the details of this option. There can be various options when it comes to the material. It is very common to use tracing paper as the material. This is because of the translucent quality of it. Yet, it is never the only option. Any paper which is light in color should be possible. 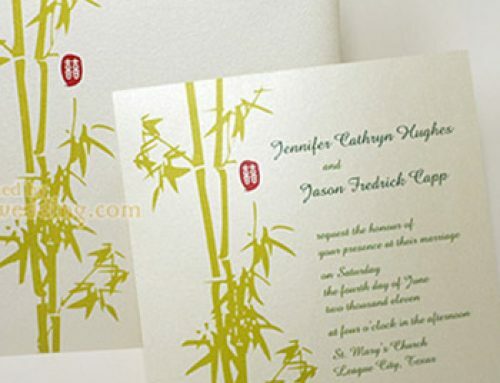 For example, using a 120 gsm pearlized off-white paper can also be something perfect. To hold the invitation insert in position, there are two choices. It is possible to hold the insert to the cover using a piece of gold or silver color string. This is a classic and usual option. Gluing it directly to the inside of the cover is another option here. However, usually we do not go for the idea of gluing if tracing paper is used. Due to the translucent quality of the tracing paper, the mark of the glue may be seen on the paper.